"We saw some very fine grapes which were ripe, Brazilian peas, pumpkins, squashes, and some good roots with a flavour like that of chards, which the Italians cultivate. "We saw two hundred Indians in this place, which is pleasant enough; and here are many nut-trees, cypresses, sassafras, oaks, ashes, and beeches, which are very fine. 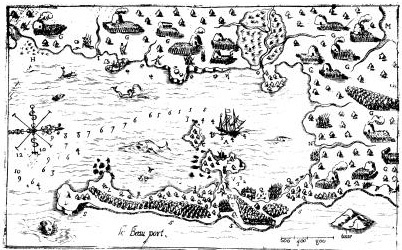 Champlain's map of Le Beau Port, 1605. "[The Indians] cut down the trees at a height of three feet from the ground; then they burn the branches upon the trunk, and sow their corn between the fallen timber; and in course of time they take out the roots. There are also fine meadows for supporting numbers of cattle. This port is very beautiful and a good one, with water enough for vessels, and shelter behind the islands. It lies in latitude 43 degrees, and we have named it the Beautiful Port." Check out exhibits on nautical history, local natural history, and local archeology and history. Explore life in the 17th century in reconstructed villages and living history cultural landscapes.